Please ask at reception to request an application form or download, print off, complete, then send to our Surgery this Application Form and Registration Questionnaire. If you live within our Practice area your application will be processed as soon as possible or you can contact the surgery to confirm your application success after 7 days from submitting the application. Please be aware that if married, you will still have to produce evidence for each person. If registering any children aged 5 and under, you will need to bring in their ‘Red Book/Child Health Record’ or a complete copy of previous immunisations (you can obtain a copy of this from your previous G.P Practice) before the registration can be processed. 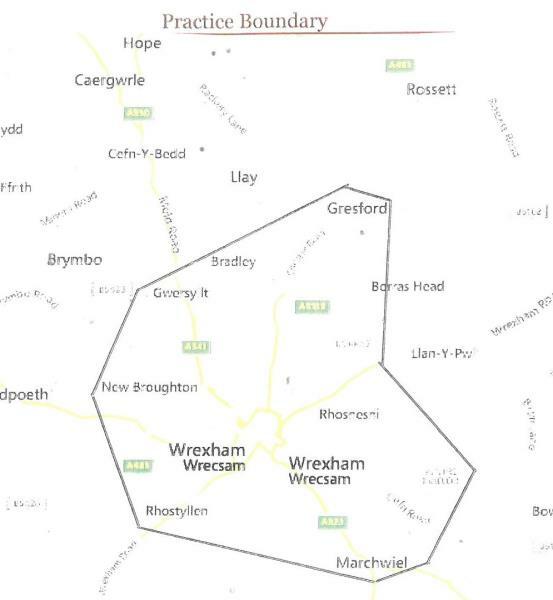 Wrexham Town Centre and most surrounding villages. Please ask at reception (or see map below). If you change your name, address or telephone number please notify the Surgery as soon as possible including details of dependants.